My research for Under the Same Blue Sky on shell shock (PTSD) in World War I uncovered constant references to generals and politicians being themselves shocked, shocked by the number of afflicted soldiers. Really? You send men into battle, enduring horrific conditions, and expect all roses and tra-la? A recent article by James Gallagher in the BBC Health News points to instances of PTSD recorded 3000 years ago. Here’s the article. 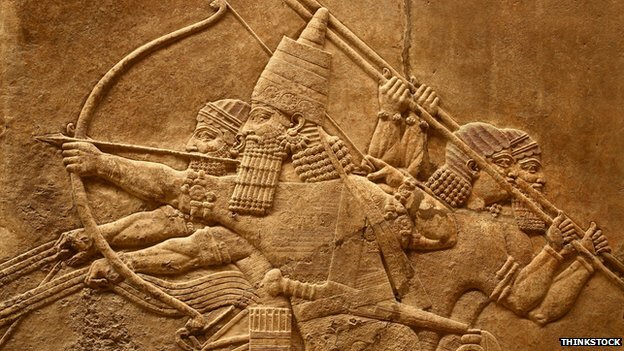 The team at Anglia Ruskin University analysed translations from ancient Iraq or Mesopotamia. Accounts of soldiers being visited by “ghosts they faced in battle” fitted with a modern diagnosis of PTSD. The condition was likely to be as old as human civilisation, the researchers concluded. Prof Jamie Hacker Hughes, a former consultant clinical psychologist for the Ministry of Defence, said the first description of PTSD was often accredited to the Greek historian Herodotus. Referring to the warrior Epizelus during the battle of Marathon in 490BC he wrote: “He suddenly lost sight of both eyes, though nothing had touched him.” But Prof Hughes’ report – titled Nothing New Under the Sun – argues there are references in the Assyrian Dynasty in Mesopotamia between 1300BC and 609BC. My father was in London during the bombings. He couldn’t not be in the house if my mother vacuumed. Th noise was too much. Also, he was terrified of baths and only sponged himself off every day. What a weight of pain and memory your father must have carried. What courage to go on. Thank you for sharing.